I’m on my own for a week. Zach is in Atlanta, and I’m already bored. Sure, there’s that whole thing called the “Superbowl” on tonight, and yeah it will be fun. I’ve already made myself enough snacks to feed 12 people. Did I mention that it’s only me? It’s ok. January is over, and February is all about splurging once again. As a result of it being my first day on my own, I decided to make donuts and catch up on all of the TV shows I don’t like to admit that I watch while Zach is around. =) I won’t type out this laundry list of TV shows. It will both scare and bore you. I promise you this. So anyway, these donuts made the whole day worth while. They are a perfectly baked vanilla donut dipped in the best chocolate glaze ever. I added the sprinkles because Valentine’s Day is 2 weeks away, and I’m obsessed with anything pink, red and purple right now. 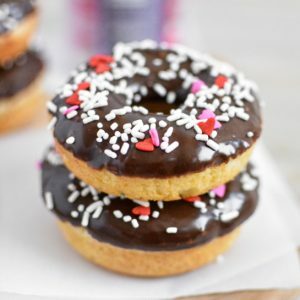 If you are looking for a great alternative to a fried donut, these are perfect and will satisfy that sweet tooth with just one bite. These chocolate-glazed baked donuts are the perfect breakfast treat, and they are a cinch to whip up! Preheat your oven to 350 degrees F and grease two 6-count donut pans. Set aside. In a large bowl, whisk together the flour, sugar, baking powder, salt, cinnamon and vanilla bean seeds. Set aside. In a small bowl, whisk together the yogurt, milk, eggs and vanilla extract. Add the wet ingredients into the dry, and stir until the dough just comes together. Do not over-mix. Add the dough to a gallon-sized plastic bag. Cut one corner off of the bag and pipe the dough into the 12 donut molds, filling each of them 3/4 of the way. Bake the donuts at 350 degrees for 8-10 minutes or until they just begin to brown and are set. Remove from oven and let cool for 2 minutes in the pan, and then transfer to a wire rack to cool the rest of the way. While the donuts are cooling, prepare your glaze. In a small saucepan, combine the chocolate chips and butter. Heat on low, continuously stirring, until the mixture has melted. Remove from heat, and add the milk, vanilla extract and confectioner''s sugar. Whisk vigorously until no clumps remain. If the glaze is too thin, add more sugar. If it is too thick, add more milk. Dip the top of each donut into the glaze and let any excess drip off. Place back on the wire rack and repeat this step for the rest of the donuts. Sprinkle with sprinkles if desired. Serve immediately or store in an airtight container for 2-3 days. Enjoy! These are absolutely gorgeous! And baked? So I won’t feel too guilty right? Those doughnuts look amazing! Zach is lucky to have those waiting for him when he gets home (if there are any left). Nope, there are totally none left. HA! I might think about whipping up another batch. We will see. I think I’ve maxed out my sweets intake for the week…if that’s at all possible.